Great Kings of Our Past. “Ho…how did they become a part of the sky?” a tiny spotted Cheetah cub speaks up from her nook hidden beneath the mighty Lion. The Lion’s gaze briefly lowers to the three orphaned cubs at his paws, to look tenderly into their innocent eyes. “You saw your family killed too?” the young gray wolf pup asked. He moves his eyes to the sky above, spying out a starry shape that reminds him of his mother. “My mother died protecting me from humans. I…I hid in a bush as they ripped her beautiful pelt off her body…. Th…they tore her fangs from her mouth and laughed as they placed them around their necks….” At the terrifying memories, tears start to roam down the cub’s long muzzle. His companions, the Cheetah and Gorilla press in closer to his flank to comfort him. Sharing similar horrible memories that he has had to endure. “Me too,” both the Cheetah and Wolf cub sob their agreement in unison. “The Creator, who has loved our kind from the very beginning has shown love and grace to our ancestors. Before the evil of men ruled, the dark night sky was an endless abyss of inky gloom, with only the moon hanging occassionaly above the earth. The animals resigned themselves to the worst. They had given up, drained of hope and despair, plunged in to an alien midnight. But then a new fire glowed when a mysterious horizon emerged with unimagined stars that shined in the dark sky. When men had lost their souls, the Creator vowed that even if our names would not be remembered, our faces always would. In all His wonder, He created the stars through our ancestors spirits. So whenever you miss your loved ones, all you have to do is look up into the sky and find their faces among the stars,” the Lion encourages thoughtfully. 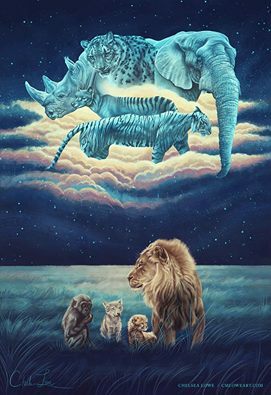 A silence falls over the four creatures as they gaze up into the animal shaped night sky overhead. The clarity of the night allows them to look into the faces of the Great Kings of their past, of long forgotten names and faces that had once roamed the earth.